MY LATE father Jose Sr.—Joe to his friends—would have turned 90 this coming Saturday. An incorrigible chain smoker, he died of an aneurysm in 1996, and there’s hardly been a day since when I haven’t thought about him. 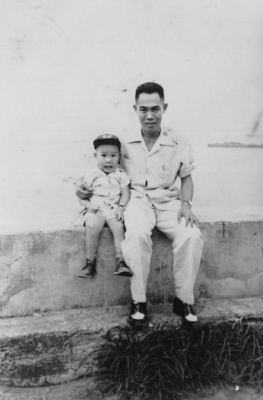 Whenever I travel, which is fairly often, I find myself talking to my dad to tell him, “Tatay, I wish you’d seen this, and this, and that.” He was a simple man whose feet never left his country nor, pretty much, his home; his joys were in the kitchen and in the garden, and his favorite pastime was doing crossword puzzles. Indeed, in his own way, he was a man of words, a gifted writer who—like I would do, myself—ghost-wrote speeches for far more powerful but much less articulate men. As modest as our circumstances were, there were always books and magazines at home, and even before I could read or write, my father fired up my imagination by reading stories to me at bedtime. In brief, I would not have become a writer had it not been for him. 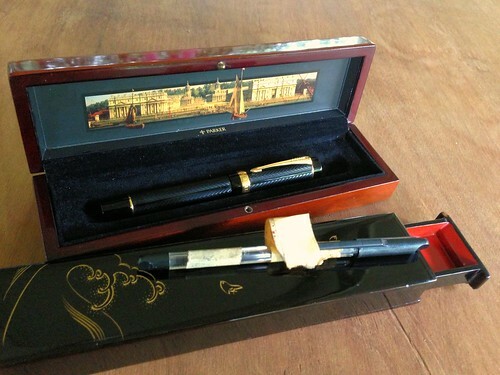 Nor, speaking of my quaint obsessions, a fountain pen collector. In his last days my father wrote with a cheap plastic Bic ballpen—the kind you can now buy by the box and forget or throw away after a few uses—but in his prime he had some Sheaffers and Parkers that he would load up with blue-black ink, whose ability to bloom into a dark-hearted rainbow on a wet napkin brought me endless fascination. Regretfully none of his fountain pens have survived—which is probably why, as with most enterprises driven by some deep longing, I keep amassing pens, as if they would somehow bring my father back. Now, begging your indulgence, here’s where this memory detours into the story of a pen and of a box. A few weeks ago, after months of eager questing, I acquired what collectors call a “grail” pen—an object of acute desire, usually for reasons of great beauty, scarcity, or some sentimental connection. In this case, it was purely a matter of esthetics and collectability: the Parker Duofold Greenwich Centennial would simply be a big, black, overpriced pen to most sensible people, but to me it was the noblest of the modern Duofolds, a reincarnation of a classic 1920s line that established the Parker name for the rest of the century. Made specifically to commemorate the Royal Observatory in Greenwich, England—which Beng and I visited around the time the pen was made in 1999—the pen was a special edition with a limited run, and had become rather hard to find. When I found one on eBay at a price I could afford, I was ecstatic, filling my posts about the find with smileys and dancing bunnies. It was near-mint, the chevrons incised into its black cap and barrel deep and lustrous, its gold fittings rich and warm. Its regal nib was a joy to write with. I couldn’t have asked for more—or perhaps I could, as it came to me without its presentation box. Pens of this caliber always came in pretty wooden boxes in themselves worthy of collection, and indeed, in one discussion of the Greenwich in a forum I frequented, another collector had reported seeing “a small but fancy box with what appeared to be a European cityscape picture on the inside of the box cover.” I wasn’t sure why, but that description sounded oddly familiar to me then. When the pen arrived from the US I put it to happy use, doodling away, writing loopy notes to no one. The Greenwich was truly an impressive pen and it sat haughtily in my pocket, but now and then I would be besieged by the collector’s constant fear of losing or dropping a valuable pen, and I would begin wishing that I had its box to put it to bed in, before I scored the exquisite chasing on the pen or, worse, let it slide out of my attention in one of my poker binges. But then of course, I didn’t have its box, and I couldn’t bear to stick it in anything beneath its stature. And then, a few nights ago, something strange happened. As I was idly surfing away to more pleasant distractions (meaning, more pen-related Websites) in the middle of finishing the draft of another commissioned piece, I stumbled on a picture of the Greenwich in its original wooden box. And at that instant, the familiarity of the box and of its pictured scene overcame me, as I realized that, of course, I’d had that box somewhere in the house, somewhere in the very room I was in. Years ago, I had found the varnished receptacle in a thrift store in America, and had been taken by its plaintive beauty—plaintive because it was clearly a box for some majestic Parker pen (the Parker name was proudly emblazoned on it), but it was empty, and I had no idea then what model its proper occupant might have been. So I put the Parker where it was meant to rest, and now I had to find new and no less suitable quarters for the Bic. Fortunately, on the same shelf was an old Japanese box, gleaming in black lacquer, that I had found in another discount store on Avenida Rizal, and which would originally have carried chopsticks. I didn’t think Tatay would have minded the switch, being an excellent cook. This entry was posted in Family & Me, Pens and tagged collecting, Dad, Parker, pens by penmanila. Bookmark the permalink. Happy birthday to you today (January 15), Butch, and a happy birthday in Heaven to your Tatay! Yes, both of you are happy with what happened to the pens! I have just read your story. ‘Fate’ seems to be the word that best describes your experience. I too have a very special, yet, in monetary terms, a worthless fountain pen which is priceless to me. It belonged to my maternal grandfather. It’s a 1950’s Waterman Ink Vac which he used everyday. It is kept in its original little blue Waterman box in the base of which he had written his name. A treasure for me. May I take this opportunity to which you and yours a very Happy New Year. lovely story of how things will eventually fall into place. thank you for sharing sir Butch!